The Pegasus Estates 31-inch Vanity in Antique White with Granite Vanity Top in Black features classic styling that adds elegance and warmth to your bathroom decor. Featuring an antique white finish, hand-carved wooden scroll accents and antique brass hardware, this vanity's pre-sealed black granite top is pre-drilled for a 8-inch widespread faucet and includes a white under counter vitreous china sink basin and 3-inch H backsplash. The two doors conceal a deep cabinet and one full-extension drawer that provide plenty of room for your bathroom necessities. Ideal for pairing with the matching Estates collection mirror, this vanity is a simple solution to upgrading your bathroom with style and functionality. Bring charm and style into your small bathroom with the elegant Cherie vanity from Foremost. A rich royal blue finish pairs beautifully with intricate carved legs and brushed nickel handles to create an eye-catching centerpiece in your space. Small but functional, the Cherie vani-ty features two U-shaped drawers and an open bottom shelf to maximize your storage space. Easy to install, the Cherie vanity comes with a vitreous china integrated sink top and adjustable leg levelers for that perfect fit. This rich Tempest Black Granite vanity top will add the finishing touch to your bathroom. The natural beauty of stone coupled with its durable, lasting appeal will bring luxurious style to any vanity. The durable top has a penetrating sealer that protects against stains by blocking pores and small cracks in the stone. A pre-attached white Vitreous China undermount sink, matching 4 backsplash and sidesplash are included, along with drillings for an 8 center faucet. The top is finished off with a meticulously cut Ogee edge detail around the sink and across the front for timeless appeal. This rich White Ash Granite vanity top will add the finishing touch to your bathroom. The natural beauty of stone coupled with its durable, lasting appeal will bring luxurious style to any vanity. The durable top has a penetrating sealer that protects against stains by blocking pores and small cracks in the stone. A pre-attached white Vitreous China undermount sink, matching 4 backsplash and sidesplash are included, along with drillings for an 8 center faucet. The top is finished off with a meticulously cut Ogee edge detail around the sink and across the front for timeless appeal. The Fresca Cambridge Transitional Bathroom Vanity with Mirror features an integrated white basin and countertop with clean lines and a thick profile. The basin sits atop an elegant Antique Coffee vanity with a unique bow front design and beveled frame. With soft closing doors and a flip down tray, the vanity has ample storage space. Each side cabinet has a quartz countertop, soft closing drawers and a handy shelf. Satin nickel handles and tapered legs add to the elegance of this vanity, while a matching rectangular mirror completes the look. Available in multiple sizes. Estates 31-inch Vanity in Antique White with Granite Vanity Top in Black The Pegasus Estates 31-inch Vanity in Antique White with Granite Vanity Top in Black features classic styling that adds elegance and warmth to your bathroom decor. 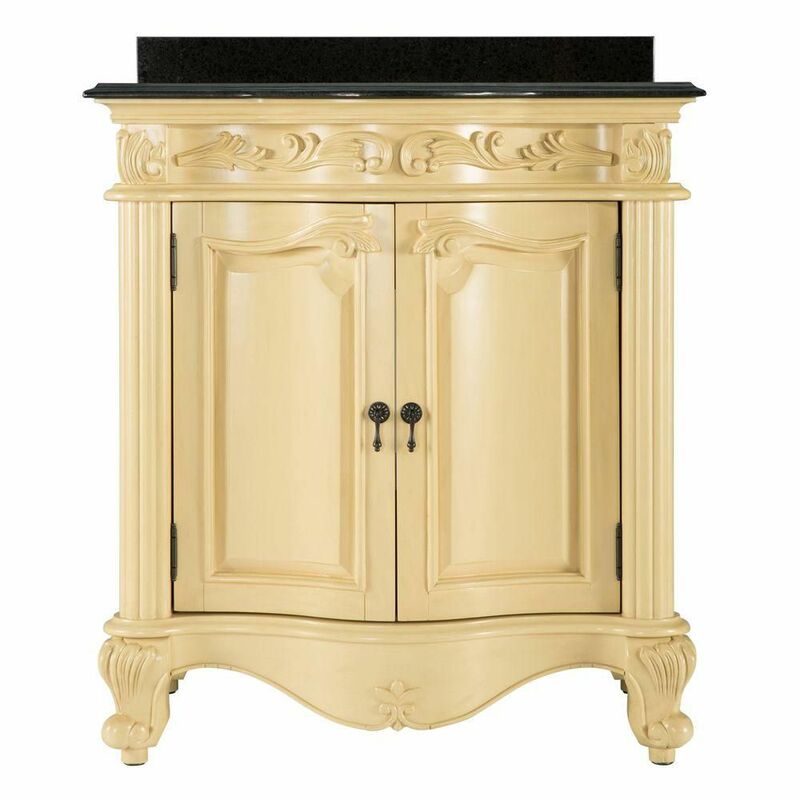 Featuring an antique white finish, hand-carved wooden scroll accents and antique brass hardware, this vanity's pre-sealed black granite top is pre-drilled for a 8-inch widespread faucet and includes a white under counter vitreous china sink basin and 3-inch H backsplash. The two doors conceal a deep cabinet and one full-extension drawer that provide plenty of room for your bathroom necessities. Ideal for pairing with the matching Estates collection mirror, this vanity is a simple solution to upgrading your bathroom with style and functionality. Estates 31-inch Vanity in Antique White with Granite Vanity Top in Black is rated 4.2 out of 5 by 20. Rated 3 out of 5 by Francisco from The vanity and mirror carvings looks good, but painting quality... The vanity and mirror carvings looks good, but painting quality and color could have been done better. Hinges and latches are great! Height is little high about 1"higher than standard. Should have been done adjustable height or at least 34" ht. max. The vanity looks great with the matching mirror though. Rated 4 out of 5 by NiceTrimmer from The vanity is lovely, but the color is NOT antique white! I'd call it mustard, very yellow. I bou... The vanity is lovely, but the color is NOT antique white! I'd call it mustard, very yellow. I bought both the vanity and matching mirror, and took both to be refinished. It's going to cost me about $500 to make these the antique white they should have been. Mustard doesn't look good with a beige marble floor, biscuit fixtures and tile. If you don't mind yellow, these pieces are nice. Rated 3 out of 5 by Joetta from looked nice until i opened the drawer two of the door knobs feel off and apart just the first time I grabbed them. Rated 2 out of 5 by Brad from It is yellow, not vintage white. It is NOT vintage white. It is a glossy yellow paint - one color only. Does not resemble the photo. Rated 5 out of 5 by helen from vanity review The vanity came with the expectation. I like the style and quality, but the color is a little bit of disappointment. On the picture and product list , it is antique white. But the real color is not cream white, it is yellow. The size and deign of the vanity is exactly what I want , so I still keep it. Rated 4 out of 5 by Anonymous from So many compliments! I love everything about the two I purchased except the color is more yellowish than I was expecting. It worked out because I hadn't bought paint yet and read the reviews so I expected them to be a little off. Rated 4 out of 5 by PlanB from BE PREPARED TO PAINT I love this vanilty inspite of the fact that I had to paint it before installing in powder room... It is no where near antique white, but an ugly yellow, so be prepared to paint! Also, had to cut out a space for trap underneath but drawer still functions.